For many years, two approaches to negotiation have prevailed: the “win-win” method exemplified in Getting to Yes by Roger Fisher, William Ury, and Bruce Patton; and the hard-bargaining style of Herb Cohen’s You Can Negotiate Anything. Now award-winning Harvard Business School professor Michael Wheeler provides a dynamic alternative to one-size-fits-all strategies that don’t match real world realities. The Art of Negotiation is packed with specific methodologies — the deal triangle that lays out your baseline, your opponent’s baseline and constraints is one potent example — and illustrated with numerous stories. 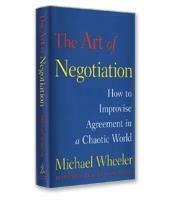 Wheeler has not written a manifesto but a practical toolkit for those looking to master the frustrating ambiguity of real-life negotiations.